We work very hard to earn our clients’ trust. We are proud to share how we are helping some of the world’s most successful companies. Sabormex manufactures and globally exports a diversity of food and beverage products. Founded in Mexico in 1964, they own a variety of well-established brands and produce a variety of products, from canned vegetables, coffee to fruit juices and sauces. Sabormex also has manufacturing and processing plants internationally. Sabormex places a high corporate priority on water recovery and minimizing wastewater treatment and overall consumption. Too much of their water used in chili and beans production was being sent to their wastewater treatment plant. That water also had too high a concentration of organic and suspended solids. Not only were they not capturing water for reuse, but the concentration of solids was also adding unnecessary stress and maintenance on the on site wastewater treatment plant. The problem would exponentially increase with higher plant production to meet rising demand. 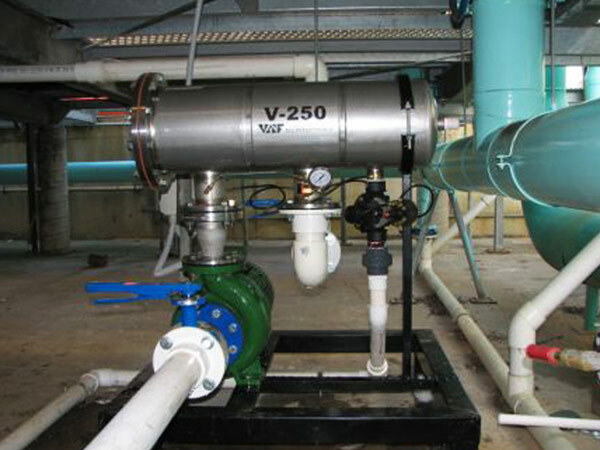 Eco BCG collaborated with their plant engineers and operations personnel to design and install a micron filter, pump and Turbulator agitation nozzles to recirculate the water a number of times per day. The objectives were to clean the water better and recycle the water without draining all of it. Sabormex is now more effectively recycling cleaner water, reducing organic discharge and reducing overall consumption. Sabormex desired a practical solution to save money and energy with their current 200HP natural gas boiler. The boiler is critical and extensively used to provide hot water for their food processing needs. Given the operating conditions of the boiler, Eco BCG determined that the Modulating Fan Powered Economizer (MFPE620) was the appropriate application to achieve Sabormex’s desired outcomes: total heat recovery of 434,502 BTU/h and heat saved at 525,644 BTU/h, with a payback within one year. A heat recovery system was designed and installed on a second 800HP boiler achieving similar operating outcomes. Sabormex plans to integrate similar applications in more of their factories’ boilers after achieving the planned savings from Eco BCG’s solution. Since 1999, Eco BCG has been dedicated to providing tailor-made environmental and operational solutions for every client. We deliver sound ROI’s, continuous improvements and environmental sustainability best practices. Our product and service offering includes consulting, data analysis, engineering and design, technology solutions, maintenance, installation and warranty, along with financing.